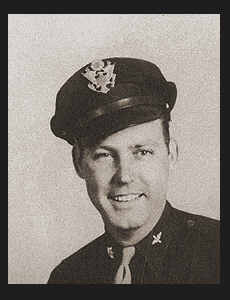 Maj. Ray E. Landrum, son of Mr. and Mrs. Clyde E. Landrum, attended Weaver High School, Cameron College and Okla. A&M. Entered Air Corps in Feb., 1940, trained in Tulsa, Okla., Randolph Field, San Antonio, Texas and Miami, Fla.; served in N. Africa, England; was taken German Prisoner in May, 1943, released in May 1945; was wounded in action in France in May, 1943; is now on terminal leave. Awarded DFC, the Purple Heart, ETO Ribbon with one Battle Star, Am Defense Ribbon, American Theatre Ribbon with one Battle Star.